ACOUSTIC WEEK: With some basic chords (C, A, G, E, D for example, plus some minor versions such as Am, Em and Dm) under your belt, you can easily reach new heights in your guitar playing by learning a few of the shapes shown here. Most are variations on basic shapes, so memorising them shouldn’t be a problem, and many are actually easier to play than the ‘beginner’ chords they’re based on. Of course, the idea is to experiment with new sounds, so these tab examples showcase the different musical moods you can create. Try out the chords, have a go at the tab, then it’s over to you to use some of our ideas in your own chord progressions. Take a look at our 30 chords acoustic guitar players need to know to further expand your chord vocabulary. Major 7 chords have a chilled-out and relaxed vibe which we’re exploring here in a rhythm idea that calls to mind 70s acoustic rockers such as Eagles and Bread. Of course, most music won’t stay strictly on one kind of chord, so, once you’ve had a go at the tab, try making up your own progressions mixing major 7s with basic major and minor chords. Look at the tab and you’ll see that Cmaj7 and Fmaj7 resemble those C and F shapes you probably already know. 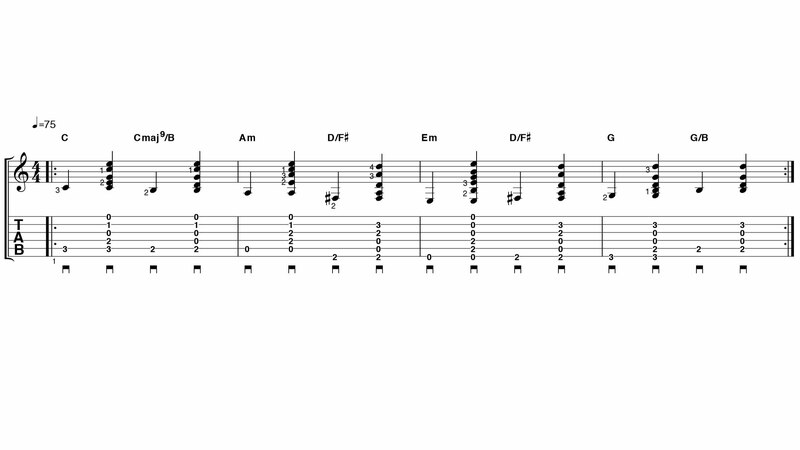 Thanks to Wonderwall, this chord trick is often attributed to Oasis but these shapes have been around far longer. Perhaps these chords do evoke the 90s, though – Alice In Chains and Smashing Pumpkins both used this approach in well- loved songs (Nutshell and Disarm) after all. There’s nothing difficult, technically. You just have to hold down the first and second strings at the 3rd fret in every chord. Sharing notes like this makes the chords link together sonically. Don’t worry about how ‘sus chords’ get their names. The sound is what’s important. You probably already know that major chords sound bright and happy, and minor chords sound dark and sad. By contrast, sus chords sound neutral, but slightly unstable, as though they want to change. Most sus chords are placed around major or minor chords – as we’ve done here. Check out Led Zeppelin’s songs Thank You and Tangerine for a major and a minor example. Chords like E7 and A7 are staple blues sounds, but that doesn’t mean they aren’t used in other genres, too. Jack Johnson takes a contemporary folk approach in Banana Pancakes and Sitting, Waiting, Wishing, mixing bluesy ‘7’ chords with major and minor shapes. We’ve stuck to ‘7’ chords here so you can hear the edgy sound these chords produce. There are three different shapes – practise the shapes and the changes before piecing the progression together. The idea here is to use chords to play a bassline, and we’re emphasising the idea by picking a bass note before each chord. Chords with a ‘/’ mark (known as ‘slash chords’) are the key: these are chords with a different root note; for example, D/F# is a D chord with F# as its bass note. Runaway Train by Soul Asylum is a great example, or, alternatively, listen to how the keyboards in Procul Harum’s A Whiter Shade Of Pale do the same job.